Momma B & Rebecca giving the looks. This podcast is founded on the belief that we need our mothers like we never have before. Not just our own mothers, but the mothers of the world. Remember a time when large families lived in one place and you knew all your neighbors? No? Well, I bet your great-grandmother does! Them's were the days when advice from elders was easy to come by. Today, many of us are separated from our families by physical distance and an ever-widening technological gap between generations. Have you noticed how these new ways of communicating often leave older generations behind and divert our attention away from them? We, the ladies of Advice from Mom, want to do our part to bridge this ever-widening generational divide. We want to bring good old-fashioned life advice to where you already are—in transit, washing the dishes, or on the run, listening to podcasts. Advice from Mom is equal parts mental health advice and motherly love. It’s a podcast made for anyone who has ever wanted a some seasoned advice on a big life question or a little help getting “unstuck” from an emotionally tricky situation. Host Rebecca Garza-Bortman brings a critical and comical angle to the show, keeping her mom on her toes with attentive follow-up questions and, occasionally, improvised musical aphorisms. Rebecca is also a singer and the designer who likes to say: "Advice is like a design solution for our feelings." Featured as “new and noteworthy” on Apple Podcasts and included on NPR's The Big Listen, this mother-daughter duo also brings you advice from guest experts including couples therapist Esther Perel; dating historian Moira Weigel; actress Michaela Watkins; and NPR's The Kitchen Sisters, as well as crisis counselors, authors, and wise creative professionals of all sorts. As the blog, Constant Listener writes: "The high-wire act of creating a show that is as insightful as it is entertaining is no small feat, but this mother-daughter pair pull it off with seeming ease." Rebecca Garza-Bortman is a designer, musician, and host of Advice from Mom. She has spent the past ten years working in San Francisco’s tech and music scenes. She led YouTube’s first visual redesign initiative before joining MasterClass as their first employee and designer. She helped the co-founders design a product & the brand, and build the team to 30 employees before starting her own company, Wise Ones. Wise Ones collects diverse life advice and distributes it in personalized podcasts. 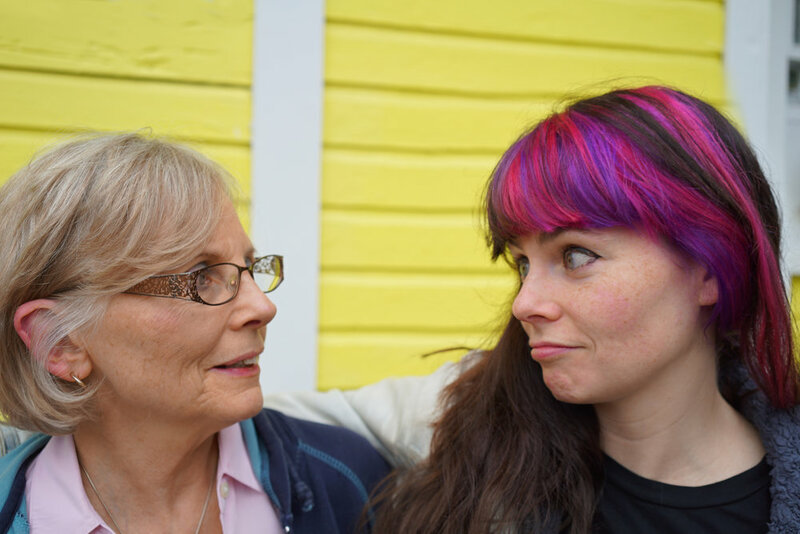 Advice from Mom is the company’s first public podcast. Making this podcast is a bootstrappin' labor of love (look, Mom, we even sing our ads!).. Since Episode 4, it's been made in creative partnership with editor and audio producer, Juliet Hinely. Juliet has produced podcasts for Audible and immersive audio tours for Detour. She is also an artist, creating experiential site-specific narratives through sound, performance, and installation. She has an MFA in Art and Design from Stamps School of Art and Design and a BFA in Fiber from he Maryland Institute College of Art. Elaborating on the vestiges of forgotten historic places, she shuffles layers of time and perceptions of place. Rad, huh? The artwork for Advice from Mom uses a photo of Momma B, taken at her brother's wedding in March of 1967. If you look very closely at the bottom of the photo, you can see the date. That's frikkin' real, archivists!! Momma B is 20 years old here and allegedly this is the only known photo of her with bangs, therefore she dislikes this photo very much. But would you look at that Mona Lisa smile? The funny thing about this photo is that it also looks just like her daughter, host Rebecca. So in some ways, it's a graphic representation of both ladies in one image. Really makes you think about genes, huh?